The sauce only takes about 15 minutes and you can roll out the dough while the sauce cooks. If you make the cheese ahead of time, this Vegan Chicago Style Deep Dish Pizza comes together pretty quickly! Most pizza dough is vegan, but be sure to check the label. There could be butter or cheese hiding in there. For this Vegan Chicago Style Deep Dish Pizza, we used a garlic herb pizza dough. We tried the recipe with whole wheat pizza dough but the crust came out a little too chewy, so we recommend a traditional white flour pizza dough for the best flavor and texture. Cheesy spicy and saucy, this vegan Chicago style deep dish pizza does it all! Made with homemade cashew cheese and sauce for maximum flavor, and store bought dough for maximum convenience. The corn meal makes it taste homemade! Preheat the oven to 450. Prepare the Vegan Mozzarella according to the recipe below and set aside. For the sauce, we recommend small tomatoes because they are more flavorful and hold their shape better in the sauce. We used mini San Marzano Roma tomatoes cut in halves or thirds. Cherry tomatoes also work well cut in half. Heat a medium skillet on medium. With a small amount of water or cooking oil, sauté the chopped tomatoes, garlic, and tomato paste for 5 minutes. Stir in the basil, salt, fennel seed, and red pepper flakes and cook for an additional 10 minutes. Stir occasionally to prevent sticking. While the sauce is cooking, stretch out the pre-made pizza dough into a semi-flat disc on a floured surface. Sprinkle 1/4 cup of corn meal onto the dough a few tablespoons at a time, kneading it into the dough until it's mostly uniform. Roll out the dough to a 10"-12" circle and sprinkle the remaining 1 tablespoon of corn meal into the bottom of a 9" cake pan. Carefully place the dough onto the cake pan. The dough should slightly hang over the edges or it will want to retract into a smaller piece. This part can be tricky. If the dough won't stay, try stretching it out a bit so more of the dough hangs over the edge. This will keep the dough in place. Using a spoon, spread the Vegan Mozzarella evenly onto the bottom of the cake pan. Top it with the sauce and smooth out the top. Unfold the edges of the dough from the lip of the cake pan. It will sink down into the pan a bit. You want it to be slightly taller than the filling. Use your fingers to even out the top of the dough. It doesn't have to be perfect. The rustic look will add to the finished pizza! Cook your Vegan Chicago Style Deep Dish Pizza for 25-30 minutes at 450 until the crust is golden brown. Let it cool for 5 minutes before slicing. Serves 2-3 hungry people! Blend all ingredients on high until smooth. Heat a small sauce pan on medium high heat, then transfer the contents of the blender to the saucepan. Cook for 4-5 minutes while stirring constantly. The cheese will turn into a thick gooey ball in the center. It will remain sauce. You can spread it on the crust or it can be chilled and cut into chunks. The cheese can also be frozen and shredded. *If your dough is not very sticky, you may need a bit less corn meal. *Make the cashew mozzarella ahead to save time. Look at that slice! I love that it looks like a piece of pie. You can hold it in your hands without it getting floppy and the crust has the perfect amount of crunch. Mmmmm, I’m getting hungry just typing this but I already ate the entire Vegan Chicago Style Deep Dish Pizza. Luckily it’s really easy to make! If you love Vegan Chicago Style Deep Dish Pizza and other delicious recipes that just so happen to be vegan, check out our 20 Minute Vegan Quesadillas or our Smoky Portobello Black Bean Burger. 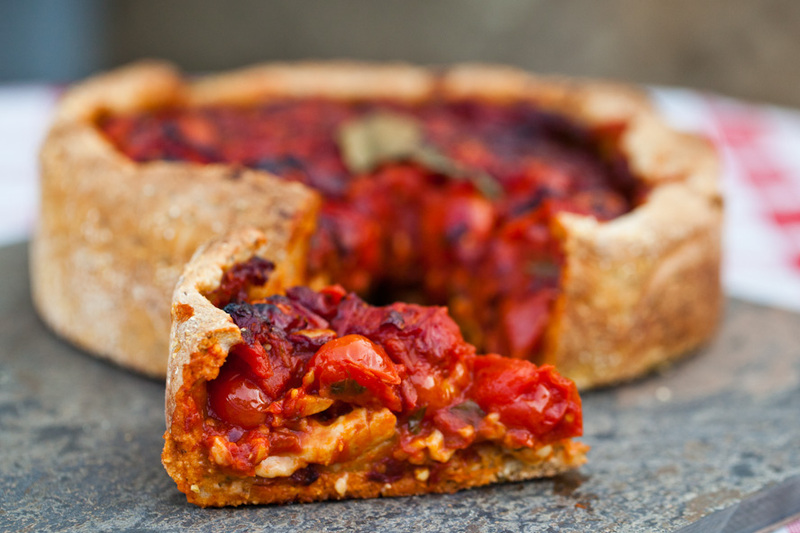 Want to save this Vegan Chicago Style Deep Dish Pizza for later? Pin the photo below! This looks AMAZING!!! Will have to try very soon!! Recipe says make vegan mozzarella according to recipe below but there were no instructions in how to make it with ingredients listed. Thanks for the heads up! I changed the recipe format recently and forgot to include that part. It’s updated now, thanks again! SOOO good, I made this yesterday – my husband says it’s the best pizza he’s ever had and I agree! Your crust looks delicious, as well as the rest of this beautiful pie. Any chance you could share the crust recipe? Hi Gail! We used a store bought crust from Trader Joe’s as I don’t have a trusted crust recipe yet. I’m working on it! Made this today, cooked in 25 minutes, if I left it in any longer, it would have been black. It came out fantastic, this week be a once a week meal. My better half and I just devoured the entire pie!! The cheese is equally as amazing. Keep recipes coming, great job!!! Hey William! Thanks for the feedback. We will test it again and adjust the recipe to give a narrower range. Thanks again and we are so happy you enjoyed the pizza! We just made this…Loved it! Great way to use lots of garden fresh tomatoes! The only thing I would say is that our particular pizza dough we purchased wasn’t very “sticky”. So using 1/4 cup of cornmeal was way too much. The cornmeal wouldn’t knead into this not so sticky dough. It also barely stuck to the bottom of our dough. This is nothing against your recipe, just a warning to others whose dough is not sticky…from your pics, yours looks quite sticky! Definitely found the new love of my life in this post! Looks delicious!! Made this last night. Really loved it. I cooked it for the indicated amount of time, but covered it with parchment paper and tinfoil for the last 10 minutes to keep it from burning. Totally loved the addition of cornmeal to the crust. Just made the pizza and the flavors were great but the consistency was runny. Any suggestions for making it firm up more? I didn’t have tapioca flour and had to sub brown rice flour. The cheese didn’t set really (in the fridge for 9 hrs), but it tasted AMAZING! Even the omni husband, who kept telling me I was going to ruin pizza, loved it. Which baking mold would you recommend for this? Cast iron? Ceramic? Other?